Hospital rooms need to be as comfortable for patients as possible to achieve the best patient outcomes. Most hospitals and clinics have shared rooms for patients, who still need their privacy. Hence the need for a good hospital curtain track system. Covoc Corporation is an industry leader offering custom privacy solutions such as made-to-size track systems, the curtains themselves, and hardware. Our company ensures that our curtain solutions offer patients the privacy they need, the materials are bacteria and fire-resistant, and the systems allow hospital staff to complete the installations hassle-free. Covoc’s products are made to order. Moreover, the manufacturer offers quick shipping services; competitive market prices; and durable products that are flame resistant, anti-microbial, and eco-friendly. Covoc offers quick shipping options for its curtain track solutions when required by customers who range from institutions such as hospitals, clinics, and doctor’s offices to colleges and hotels. Covoc’s standard shipping time is four to seven days for its curtain tracks and two to three weeks for the curtains themselves, much faster than virtually any competitor. Moreover, clients who have an urgent need are offered a convenient Quick Ship program. Call Covoc now to take advantage of the Quick Ship program. Covoc offers some of the most competitive prices in the market. Since they are direct from the manufacturer on its high-quality items, customers get a high value for their money. The hospital curtain track system prices range from $41.30 for its type 1, cubicle tracks to $162 for its type 14 oval shape cubicle tracks. All the hospital curtain track solutions from Covoc are made from durable materials that are custom made to fit any space as required by the customer. Each hospital track is designed to be a perfect fit for the specific dimensions of your medical facility, as well as other applications. They are available in four distinct finishes: Anodized aluminum, white, black, and pink. Tracks can withstand daily use and abuse and come with a one-year warranty. All the curtains from Covoc are made to be flame resistant. They are also rated for the most stringent of fire inspections before they are shipped to customers. This is an important distinction, because the vast majority of curtains sold do not have the necessary fire resistance rating, making them inappropriate for hospital, clinic, and hotel settings. Since Covoc primarily supplies to hospitals and medical institutions, its curtains are all anti-microbial, which promotes healthy workplaces for hospital staff and living environment for patients. For better patient outcomes, choose a highly rated anti-microbial fabric. Covoc’s curtains are made from eco-friendly materials wherever possible, and are Green Guard Certified. What’s more, everything is made right here in the U.S.A. The Covoc Corporation is a family-owned and operated enterprise located in Fullerton, California, with regional offices in Georgia, and Hawaii. It is presently the leading manufacturer and distributor of custom cubicle curtains in the country. Covoc has specialized in hospital curtain track solutions as well as window coverings and accessories for hospitals, medical clinics, educational facilities, businesses, and commercial interiors. It focuses on offering innovatively designed products, high-quality workmanship, and top-notch customer service. All hospitals and medical institutions have a duty and responsibility to serve their patients during their time of need to the best of their ability. This extends from offering top-quality medical care to less obvious elements, such as ensuring patient privacy and comfort. Since many patients admitted for overnight or longer stays share rooms, and almost all have a need for privacy even in a one-person room, there is a need to install a good hospital curtain to maintain privacy. While hospital rooms equipped to house multiple patients offer comradery and much-needed company during recovery, they often lack privacy. As a result, family members, nurses, and doctors find it difficult to engage in personal conversations especially those related to diagnosis, treatment options, or other private medical issues. Therefore, Covoc has dedicated its resources to come up with an unmatched curtain system to solve this patient-privacy problem. Our curtains, track systems, and other hardware offer patients and hospital staff the privacy and convenience they need, respectively. Our curtain track system can effectively be utilized in multiple locations such as patient rooms, exam rooms, triage areas, operating rooms, and emergency rooms. Covoc manufactures durable privacy curtains that cater to almost any configuration. Our fabrics come in different colors, styles, sizes, and patterns making them ideal for use in any setting. There is more to patient privacy than simply enclosing them in their dedicated space. Hence, room darkening curtains can be helpful to protect patients from light intrusions. Light intrusions make it difficult for some patients to sleep, rest, or relax, which can be quite uncomfortable. Covoc’s room darkening, or blackout curtains are designed to block out the surrounding light. They come in two styles: with mesh and without. The mesh-styled allows 20 inches of space between the fabric and fire suppression systems, as per fire codes. Also, all the blackout curtains and valances come in different colors. Being able to order your blackout curtains, privacy curtains, and curtain tracks from the same source -- know you are getting the best quality and value -- makes it so much easier for your procurement team. Covoc provides commercial-grade shower curtains that ensure privacy in hospital bathrooms. The curtains are easy to use and come in different customizable sizes to meet the need of institutional customers. Hospitals can select from the manufacturer’s varieties including clear vinyl, shower shield, and heavy-duty vinyl curtains. Also, many of Covoc’s curtains are microbial, tear-resistant, odor-resistant, and stain-resistant. I.V. track systems are used throughout the hospital by doctors, nurses, and surgeons; thus, they need to be conveniently placed to keep them out of the way while allowing the staff to utilize them when needed. Our I.V. track systems is an innovative and practical solution. Covoc offers window coverings for both privacy, and to be able to allow patients and staff to control amount of sunlight. Not that window treatments are not only limited to patient rooms. Areas like waiting rooms and reception areas also benefit from Covoc’s wide selection of draperies, vertical and horizontal blinds, as well as window shades. Covoc offers free-standing portable and free-standing privacy screen solutions with an accordion hinge to allow repositioning and folding for storage. Our privacy screen combine the high quality, standards, and fire resistant ratings with the ultimate in flexible configuration. These screens particularly come in handy during emergencies, in unconventional medical settings, or in spaces where a conventional curtain track system cannot be installed. Whether you have super high ceilings, are converting your school gymnasium into an emergency shelter, or are using tents as an emergency triage base, Covo’s privacy screens are remarkably handy assets. Covoc provides three models (two-section, three-section, and four-section) made from anti-bacterial, anti-static vinyl panels. No matter an institution’s unique privacy needs, Covoc Corporation remains dedicated to providing an unmatched hospital curtain track system and other hardware to not only enhance patient-privacy but also the convenience and functionality of these facilities. 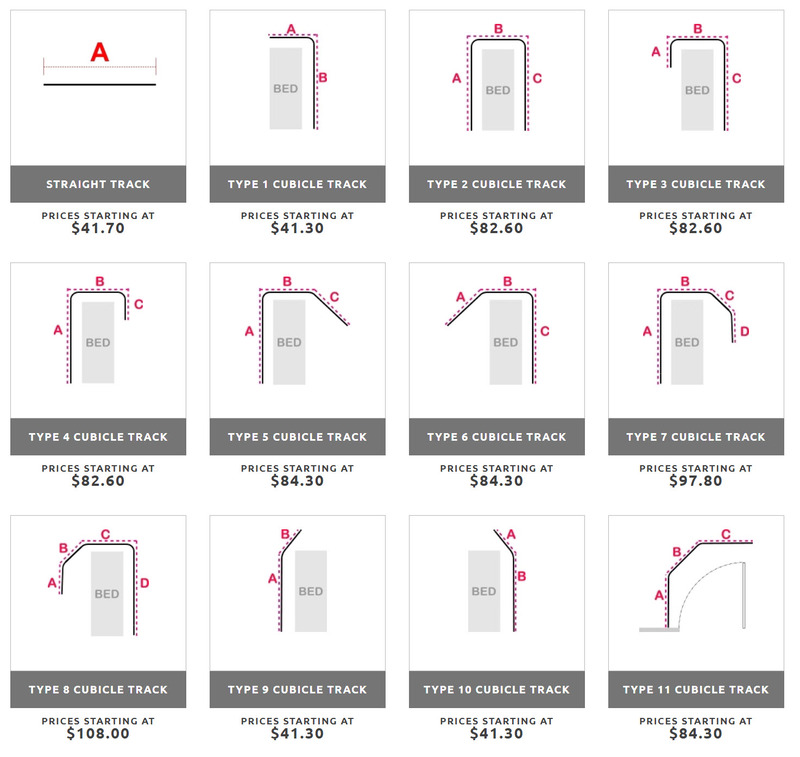 All curtain tracks are customizable, made to order, and fit any customer needs. Start building your system now, or call our helpful reps to answer any questions and guide you through the process.